Jakatawang (Antasena) Bima's third wife was Dewi Urang Ayu, the daughter of Sang Hyang Baruna, a powerful god living under the ocean. Baruna was a very good god, he had helped several kings such as Arjuna Sasrabahu, Rama etc. Urang Ayu gave birth to Antasena, another warrior with strong magical ability. He could kill his enemies by spitting over his poison. In battle or war, he was very dangerous. He was good and honest, but like Bima he spoke to everyone in Ngoko language, (the lowest level of language, spoke between friends, the refined one is Kromo language, used to respected or elder people). He was very much concern for the victory of Pendawa in Baratayuda. He was advised by his grand-father to ask to Sang Hyang Wenang, the greatest decision-maker of life, the grand-father of Batara Guru. Antasena made an audience to Sang Hyang Wenang and ask him what he supposed to do, to secure Pandawa’s victory. Sang Hayang Wenang told him, that he had to be a Tumbal (spiritual tool to gain something) for Pendawa. In other word, he had to sacrifice his life. Antasena loving his parents very much, had no objection. Sang Hyang Wenang stared sharply, using his extraordinary powerful eyes at Antasena’s face, focused on a spot between his eyes. Astonishingly, Antasena’s body became smaller and smaller, at last he vanished. His soul returned to heaven. Thus, he did not take part in Baratayuda. 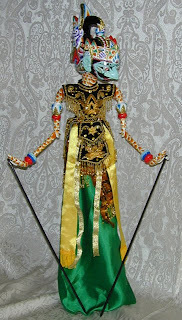 The wayang has a strong tradition in the world of Java and Indonesia, representing the struggle between good and evil. This puppet is on a base and stands a little over 31". He can be removed from the base and both the head and arms can be moved. It has very finely detailed carvings on the head, with vivid color and detailed paintings. His body is covered with scales with great colors and detail. This is a truly beautiful collectors piece. The body is beautifully decorated in beads and Prada Batik. Each puppet is individually made by hand making each unique. These are performance puppets, used in the actual shows. They are made for the artists who make the puppets for Asep Sunarya (puppet master) who performs worldwide.